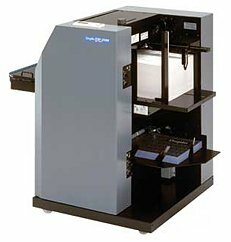 Introducing the ultimate document sheet feeder, the Duplo DSF-2000 System combines the advantage of both in-line and off-line finishing solutions by transforming pre-collated sheets taken directly from digital copiers or printers, into professional booklets while maintaining set integrity. The DSF-2000 System combines the advantage of both in-line and off-line finishing solutions by transforming pre-collated digitally-printed sheets into professional booklets. The DSF-2000 feeds up to 200 sheets per minute and has superb versatility and can handle a wide variety of paper sizes and weights. The DSF-2000 primary feed tray features a 7.78″ loading capacity (2,000 sheets), while the cover feed tray holds a 2.36″ (600 sheets) capacity. The DSF-2000 becomes one powerful digital print finishing system, offering complete flexibility by accepting both set-by-set of the traditional offset market and sheet-by-sheet pre-collated output from digital printers. The full integration between the DSF-2000 and DBM-120SxS allows for full control of the entire system through the sheet feeder’s control panel. The DBM-120SxS is the ideal finishing solution for short and medium volume runs. If you have any questions or are interested in purchasing the Duplo DSF-2000 Sheet Feeder, visit us at SpiralBinding.com. We have great pricing on a full line of Collating Machines. Call us at 1-800-631-3572 for more information!